Last month I was invited to sample the Island Grill’s Valentine’s Day menu at the Lancaster London. As my husband was working, I took along my best friend Rachel. Since trying the nine dish extravaganza, we’ve fallen in love and have both run off together. That’s how good it was. 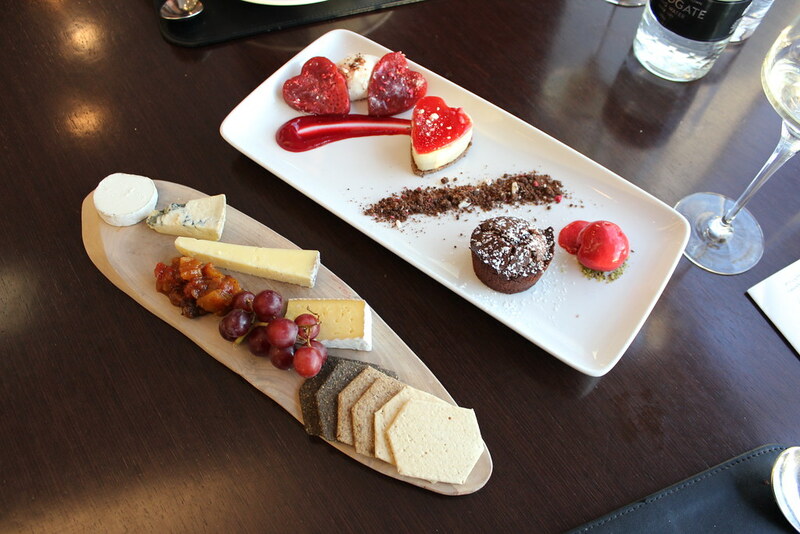 The menu is £38 a head, and consists of three starters, three main courses, and a spread of desserts and a cheese board. I loved the concept – it’s the perfect way to spend the time with your loved one, discussing your favourite dishes, dividing up the plates, and doling out samples. 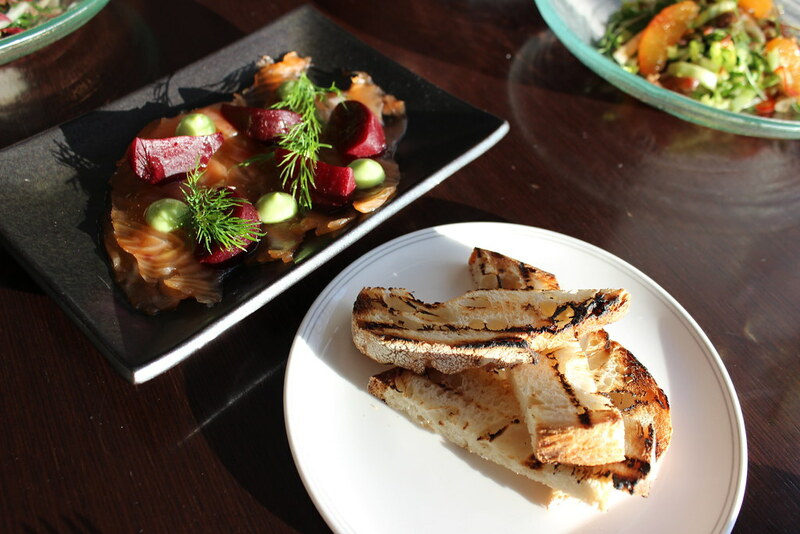 It’s an adventurous and varied spread, so if your partner is an adventurous foodie, you’ll both be in heaven. 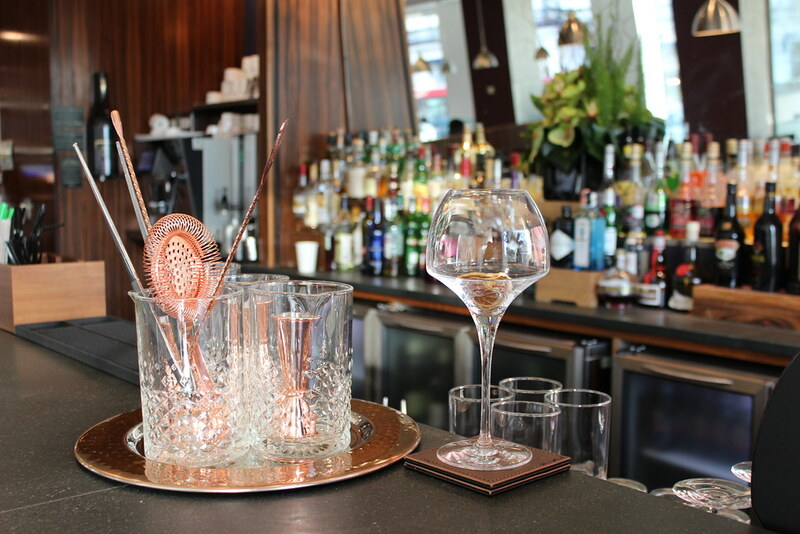 Oh, and I have to mention – I love the fact that Lancaster London is now serving a lovely list of Seedlip cocktails – all non-alcoholic, made with Seedlips unique non-alcoholic spirits! 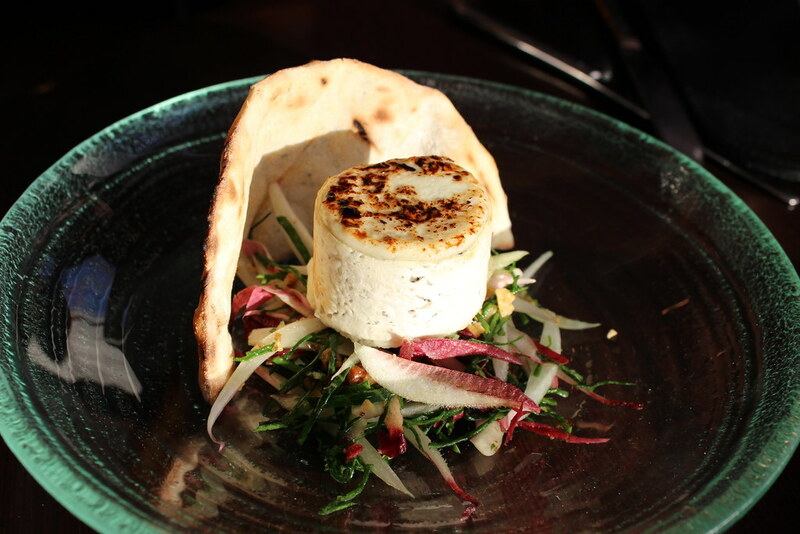 We started with the warm Golden Cross goat’s cheese, which was served with a rosemary flatbread and a walnut and endive salad. 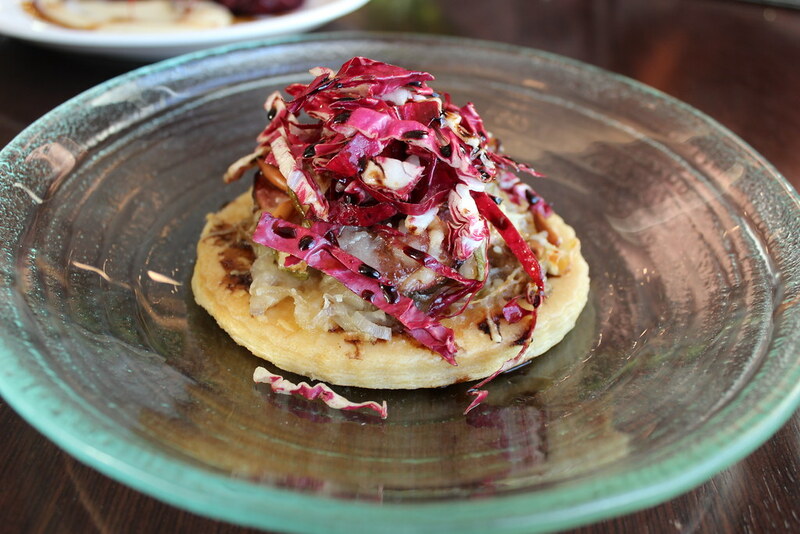 The flatbread in particular was amazing – scented like a herb garden in summer, with just the right amount of rosemary to boost the taste without being overwhelming. The cheese was intensely creamy, and cut beautifully by the sharp salad and crunchy walnuts. The Lancaster London Smoked Salmon consisted of high quality fish, slabs of beetroot and creamy avocado mousse. 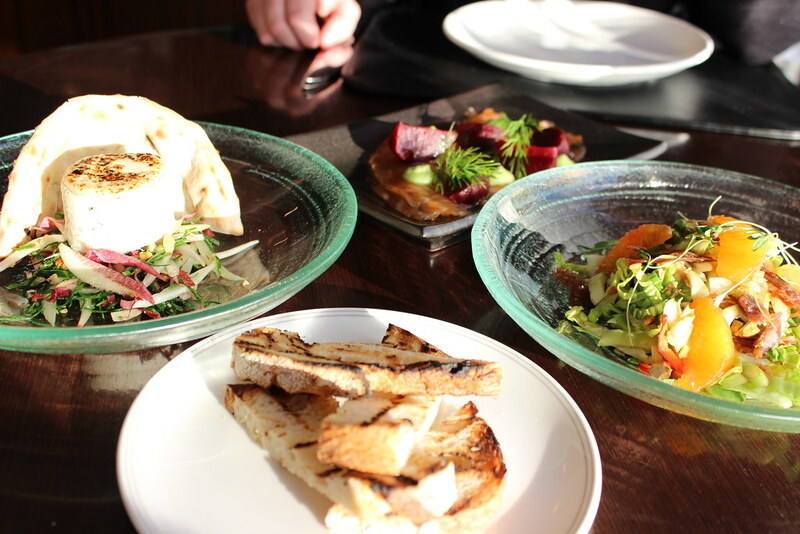 On the side were slices of toasted sourdough – you can’t beat a good, chewy slab of bread with your starter! I’ve never had this combination before – all of the textures were very similar, so the bread was a great contrast. 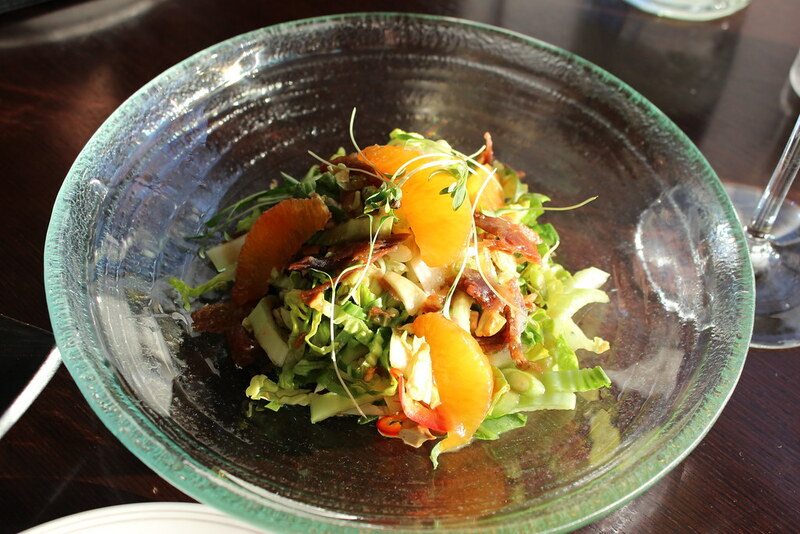 Our favourite starter of the three was the crispy Gressingham duck salad – served with pak choi, blood orange, and soy and lime dressing. Slightly spicy, sweet and fruity, with contrasting textures from the peanuts and crispy duck, this was incredible. Light, crunchy and satisfying – we both loved it! 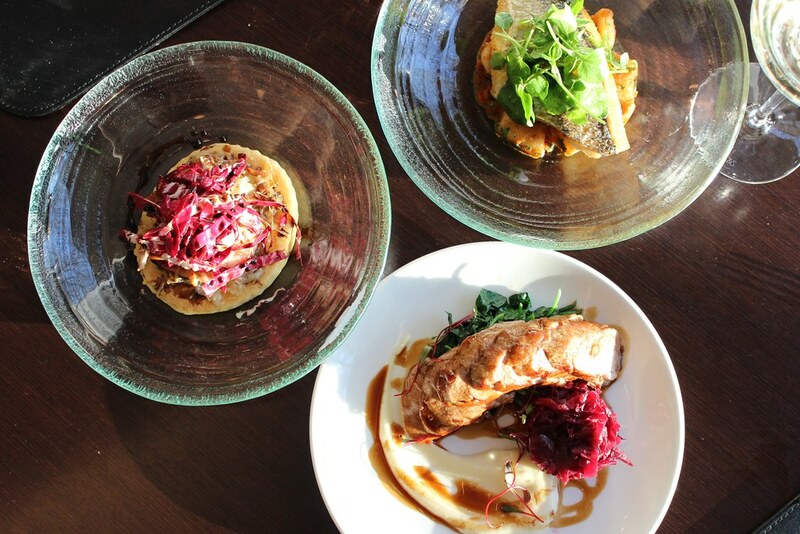 Our trio of main courses were next. As with the starters, there was a great balance of fish, vegetable and meat dishes, and it was hard to pick a favourite amongst them. 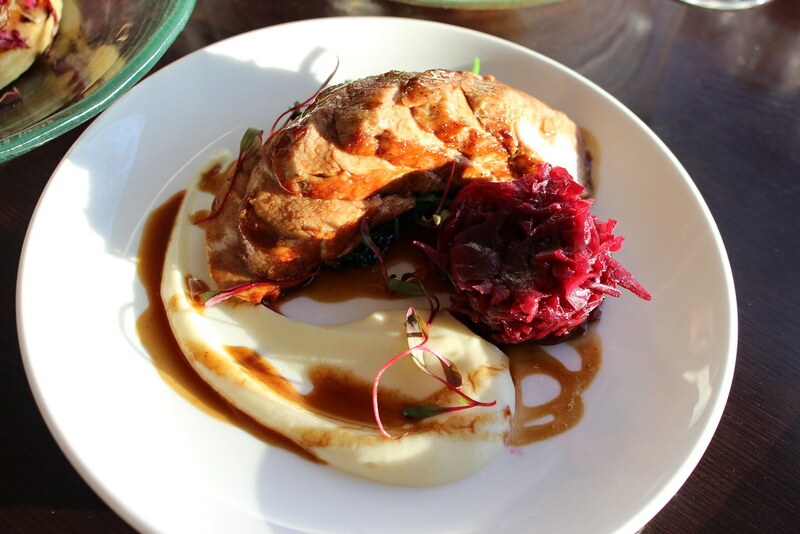 The roast fillet of Suffolk pork came with celeriac puree, wilted spinach, and braised red cabbage. The pork was succulent and tender, and the puree was creamy and light – I’m getting more and more fond of celeriac and Jerusalem artichoke dishes instead of potato, they just have a lightness and more earthy flavour. The jus was gorgeous, and the piquant red cabbage cut through dish perfectly. 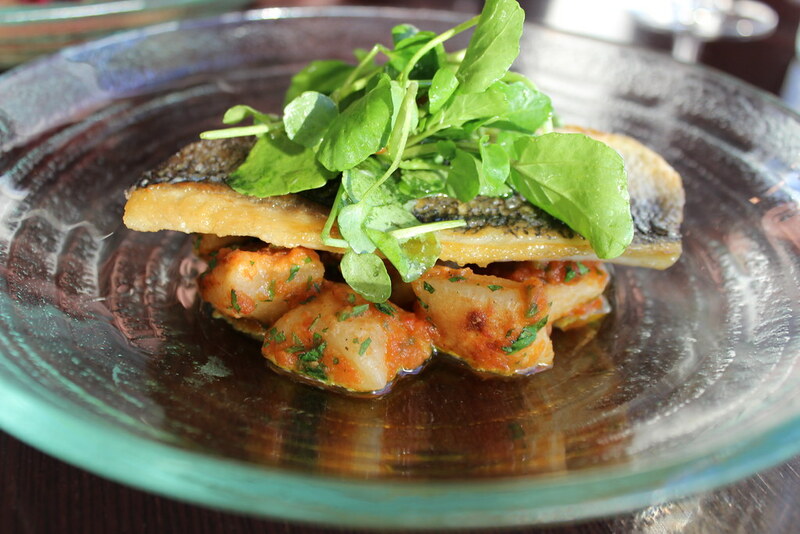 I was also blown away by the pan-fried sea bream with potato gnocchi, confit tomato, and watercress and keta salad. The sea bream was seasoned to perfection, and the skin was perfectly crisp. The soft, moist and flaky fish was balanced by the firm and slightly crisped gnocchi, whch were smooth, slightly sweet, and springy. The confit tomato made a fabulous sauce – we were both lapping this up! When we were finishing our main courses, our forks clashed – our eyes met. What was this feeling? There was heat in my cheeks – but none of the dishes contained chilli… How odd! Pudding time! I had to tear myself away from my ponderings to regard our spread of desserts. Dark chocolate fondant and raspberry sorbet strawberry panna cotta with fresh berry compote, and the forty mile cheese board, made with ingredients sourced from… within forty miles! 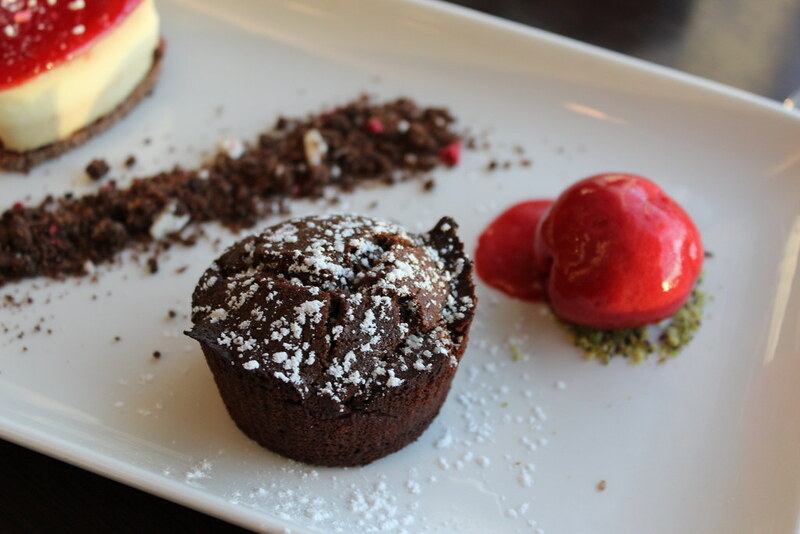 The chocolate fondant was utterly divine and a real highlight for me – combined with the sharp sorbet it was gorgeous. I never usually like this combination, but I couldn’t get enough. Nor could Rachel – and I was noticing more and more how the light from the window was shining on her beautiful brown hair. Another good thing about the fondant was that it had a lovely crisp crust on it – and the centre was melting smooth! I wonder whether Rachel is feeling hot too… Is it just the sunshine? I’ve said before how much I love a cheeseboard (but not as much as I love Rachel), so I was really excited that the menu included one too! 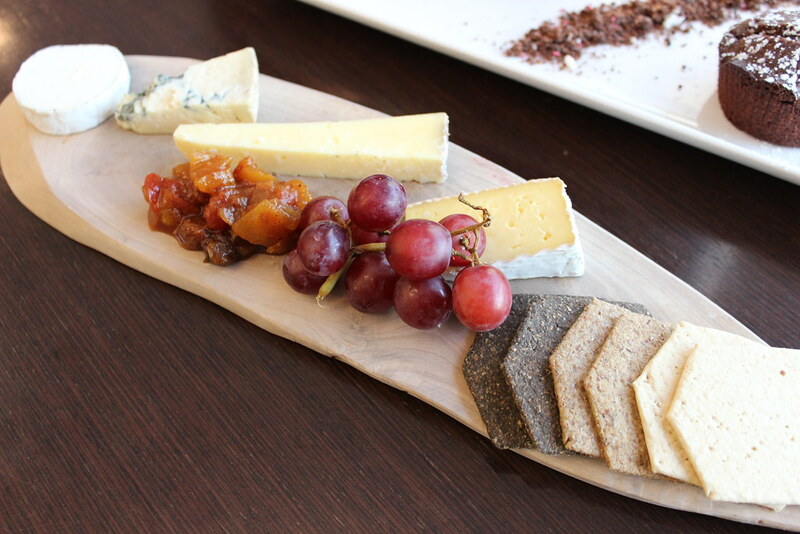 The selection of cheeses was perfect; a goat’s cheese, blue cheese, hard cheese and a soft cheese – exactly what you need! The chutney was scrumptious too! By the end of the meal, I was beginning to realise that the atmosphere had become decidedly romantic. This nine course menu had woven its magic on us both, and we realised that the more we had eaten, the more we had fallen in love. By the end, we had no choice but to text our respective partners and let them know it was over. It was sad, but it wasn’t fair to string them along any more. We eloped to Hyde Park and have made our home in a particularly large tree – I can’t tell you which one for privacy purposes, but it has Wi-Fi. The Valentine’s Day sharing menu is available from 10-14 February for £38 a head, and includes a complimentary drink on arrival, and an edible gift to take home with you (ours was delicious – I’m eating it in our treehouse right now!). Also at Lancaster London, try the Valentine’s HeART afternoon tea – if it’s anywhere near as good as their Halloween offering (which was AH-MAZING), it’s sure to get hearts afluttering! On the menu will be oysters, heart-shaped macaroons, caviar and Love You honey eclairs. The menu starts from £40 a head. Check out the hotel at www.lancasterlondon.com (it’s a completely gorgeous place! ), and the Valentine’s Day offerings here. Our meal was complimentary, all photos, text and opinions are my own!